Susie Wee, vice-president and CTO of DevNet at Cisco, during her keynote at Cisco Live 2018. Photo from Cisco. ORLANDO — Cisco System’s developer program DevNet – which has surpassed 500,000 registered members – received a lot of attention at its flagship event this week, and its new DevNet Ecosystem Exchange program, available now, includes 1,300 applications for system integrators and other partners to access. While many partners have become familiar with some of DevNet’s capabilities since 2014 when DevNet was created, this new “solutions catalogue” as Susie Wee calls it, could unleash apps and integrations that allow for much faster innovation. Alongside the partner exchange program, Cisco launched the DevNet Code Exchange, a curated list of sample codes from GitHub include adaptors, tools, and SDKs, all of which are compiled by Cisco and the DevNet community. The platform is for anyone working on smaller components of a solution. 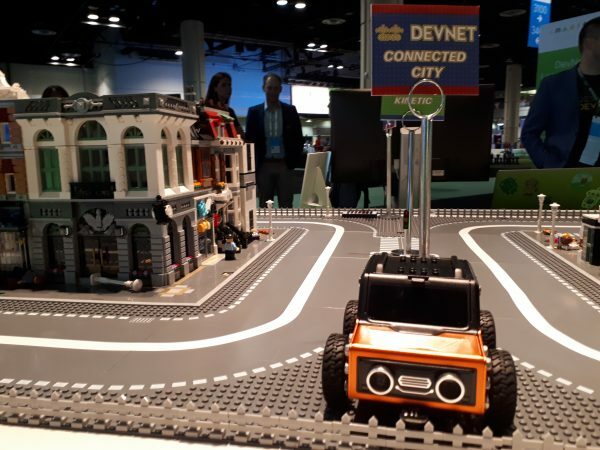 A booth at the DevNet Zone at Cisco Live focuses on the world of IoT, and allows people to program a small-scale smart city built with Lego. Photo by Alex Coop. “DevNet within Cisco, is teamed up with very closely with our partner organization, our sales organization, and our businesses and partners – we work very much within the fabric of the entire company,” said Wee. Rick Snyder, vice president of Americas Partner Organization, echoed her thoughts, adding DevNet is also “inextricably linked” to its existing partner programs. Wee also praised Canada’s efforts when it comes to building smart cities, adding it will lead to an explosion of innovative ideas and networks. Cisco also launched the DevNet DNA Developer Center, a one-stop-shop for developers to build applications and integrations on the DNA Center platform, and includes various resources, use cases and learning materials for developers.